Contrary to past building code requirements and over 70-plus years of continuous, widespread use, ventilated crawl spaces are not such a good idea in our North Alabama climate. Letting 90-degree air with 70% relative humidity seep into an enclosed crawl space through the perimeter foundation vents can cause a lot of moisture problems if there is air conditioning duct work present. The ducts make the enclosed area quite cool and when this warm outside humid air entering the crawl space drops from 90 degrees to say 70 degrees, it must give up its moisture. This can lead to 100% relative humidity conditions inside the crawl space. This abundant moisture condenses on the duct work and on the overlying air-conditioned wood floor system. This severe wetness can lead to rapid degradation of the floor system as fungus sets in and feeds on the wood. In these severe cases, the perimeter foundation vents must be closed off, the leaking duct work joints repaired (sealed tight) and a dehumidifier and fan installed in the crawl space. These measures will lower the humidity and the moisture content of the wood floor system, thus dormatizing the fungus, which must have wet wood to survive. Once dried, the fungus-stained wood floor system can be soda-blasted and made to look brand new. 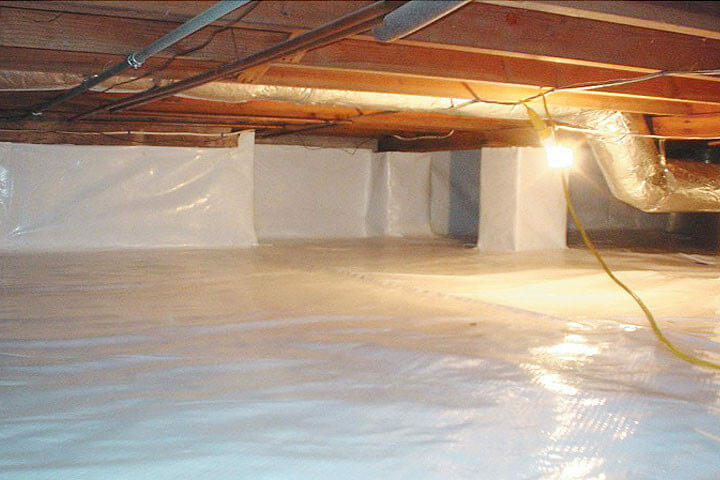 The existing vapor barrier (now covered in baking soda) can be removed, a new seamless vapor barrier installed and the new sparkling clean crawl space should then remain dry forever, as long as water is not seeping into the space during heavy rains or plumbing leaks. The dehumidifier is no longer needed. To check for moisture after this, someone must crawl beneath the home each month for the first year afterward and perform a thorough inspection. After this, the inspections can be done at least twice per year. The later is true of any home. So Where Do Encapsulation Systems Come Into Play? This type of system uses a relatively thick vapor barrier, 16-30 mil thick polyethelyne, that is taped at all seams to create a seamless vapor barrier across the entire crawl space floor and up the perimeter foundation walls—thus creating an empty, reversed swimming pool liner. The crawl space is literally encapsulated with a vinyl liner. No moisture can seep in from the ground or the outside air. Even the interior foundation piers are wrapped in poly and sealed to the floor barrier. These systems actually make the inspection of a crawl space a fun adventure, so homeowners, pest control contractors and home inspectors especially like them. The place is literally spotless. No dust, no insects, no moisture—nothing but clean, white, bright, shiny poly under the home. But to get this, you have to be willing to pay for it and this can cost in upwards of $ 3.00 per square foot of crawl space floor area. A 2000 sq ft home can cost $6,000.00 or more. And the contractors always want to add in an interior foundation drainage system with sump pump and high water level alarm, for an additional $ 5,000.00 or more and a dehumidifier for $ 2,000.00 or more. Before you know it, you’re spending $ 10,000.00 or more. Because of the public’s fear of moisture and mold, there are a host of mold remediators, crawl space encapsulation system installers, and foundation drainage specialists that all offer solutions to combat the formation of mold on the floor joists. I’ve always called it fungus because that is what it is, but if you call it mold, then it gets everyone’s attention and everyone can agree to spend large amounts of money to correct it. The one fact that everyone forgets about a wood floor system constructed over a ventilated crawl space is that wood is a hygroscopic material. Wood tries to reach moisture equilibrium with the surrounding atmosphere–either absorbing moisture out of humid air or off-gassing moisture into dry air. We now know that during the summer months, humidity increases in crawl spaces so the wood floor can take on moisture hygroscopically as well as by condensation. So even in crawl spaces that do not have duct work, home inspectors and pest control contractors often cite fungus or mold growing on the floor joists. This fungus or mold is surficial and related to a lightly wet wooden surface where airborne fungi can land and colonize. This is perfectly normal in any crawl space in North Alabama. It doesn’t mean that you need to install crawl space encapsulation systems. When you’re thinking about spending the enormous costs of encapsulation systems, it makes perfect sense to get a second opinion from a non-biased person or firm, such as JADE Engineering and Home Inspection. We don’t make our living installing crawl space encapsulation systems, drainage systems and dehumidifiers. We simply evaluate the facts. We look at the conditions inside and outside the crawl space. We make moisture content measurements of the wood floor structure. We take humidity readings inside the crawl space. We study the site drainage conditions. With all this information, we can explain to you what type of system would best suit your needs and why. Hopefully, this will cost much less than the bids exceeding $ 7,000.00 and more.